Mixed-use, transit-oriented development in San Diego by Chris licensed under Creative Commons. As part of its effort to create a new, modern zoning ordinance to replace its bloated and antiquated half-century-old code, Prince George’s County is proposing a series of new mixed-use zones for its suburban town centers to encourage more development around transit. That’s good news — but if these new zones are going to thrive, they need to include more homes. The current legislative draft proposes five mixed-use “Transit-Oriented/Activity Center” zones, all of which encourage walkable urbanism and transit-oriented development at varying scales. The ordinance also “strongly encourages” developing at least some mid-rise (generally three to seven stories tall) mixed-use buildings, with apartments or condos located above shops, businesses, or offices. Unfortunately, the county is also proposing restrictive caps on housing while allowing a glut of office space. That could make it nearly impossible for developers to justify the higher costs and greater hassle of constructing mixed-use buildings in the area. There's more demand for homes than for offices, and developers need to be able to include enough housing in their projects to get a good return on their investment. As a result of prevailing market forces in the Washington region, Prince George’s is not likely to see many mixed-use buildings with multiple stories of office space above retail in the foreseeable future — particularly outside of its three “downtown” Metro station areas. That's because the region’s office market is already significantly oversupplied, and growing more so by the day. Local developers continue to speculatively build new office buildings near Metro in hopes of attracting businesses that want to upgrade and modernize their existing office spaces. Meanwhile, the region’s 14.2% office vacancy rate is among the highest in the nation. That's not only due to the current construction boom, but also because businesses and organizations require fewer square feet per worker today than in the past. Open floor plans, use of electronic data over paper files, and the increasing popularity of telework are all shrinking offices. Office space available by Ron Cogswell licensed under Creative Commons. These trends are leading many developers to convert some of their older, surplus office space into condominiums or rental apartments. They're also driving down office rents in older office buildings, allowing businesses that may not have been able to afford rent in the past to move closer downtown. For these reasons, the success of Prince George’s efforts to bring more mixed-use, transit-oriented development into the county will hinge on its ability to encourage developers to focus on building apartments and condominiums over ground-floor retail and offices. There is a significant unmet need in the region for multifamily housing near transit, particularly for millennials and seniors. The good news is: mixed-use development recently got easier, thanks to a 2015 change in the International Building Code. Developers can now build five- or six-story wood-framed buildings over a concrete podium of one or more stories up to 85 feet high. Using wood framing on the upper levels of mid-rise buildings, rather than steel or concrete, helps to bring down construction costs. The concrete podiums can accommodate ground-floor shops, offices, or parking. Neighborhood Activity Center (NAC): The NAC zone is designed for small-scale transit-oriented development, such as the kind anticipated around future Purple Line stations. Town Activity Center (TAC): The TAC zone is meant to accommodate more automobile-oriented, yet walkable-once-you-get-there development of the kind currently seen at National Harbor or Bowie Town Center. Regional Transit-Oriented High-Intensity (RTO-H): The RTO-H zones are slotted for the three “downtowns” designated by Plan Prince George’s 2035, the county’s comprehensive plan: Largo Town Center, New Carrollton, and Prince George’s Plaza. For example, in the LTO zone, housing densities are capped at 40-60 dwelling units per acre. Essentially that means that in a modest mid-rise building, the apartment or condo units would be in excess of 2,500 square feet each! That’s bigger than the median size of newly constructed single-family detached homes, which are typically 2,426 square feet. Other mixed-use housing caps are not much higher in this code. Only within a quarter mile of the RTO zones, where high-rise buildings are supposed to predominate, do the caps exceed 80 dwelling unites per acre. The Palette apartments. Image created with Google Earth. To give a real-world example: consider The Palette located in Arts District Hyattsville. It's a mixed-use building with four stories of apartments over a multi-story concrete podium containing parking. Its site plan states that there are 198 multifamily units of varying sizes in the building, which sits on a 1.85-acre lot, creating a residential density of 107 dwelling units per acre. Under the newly-proposed mixed use zones, the Palette could not be built in Arts District Hyattsville nor near most of the county’s non-downtown Metro station areas because the development would exceed the applicable density caps. Even on a one-acre lot, it would be possible to build 200 apartments at 750 square feet each in a mid-rise, four-over-one-story mixed-use building. That is larger than most one-bedroom apartments currently built in this region. Alternatively, a developer could build 125 units at a more generous 1,200 square feet each, which is roughly in between the nationwide median square footage for multifamily rental (1,088 SF) and multifamily for-sale (1,494 SF) units. 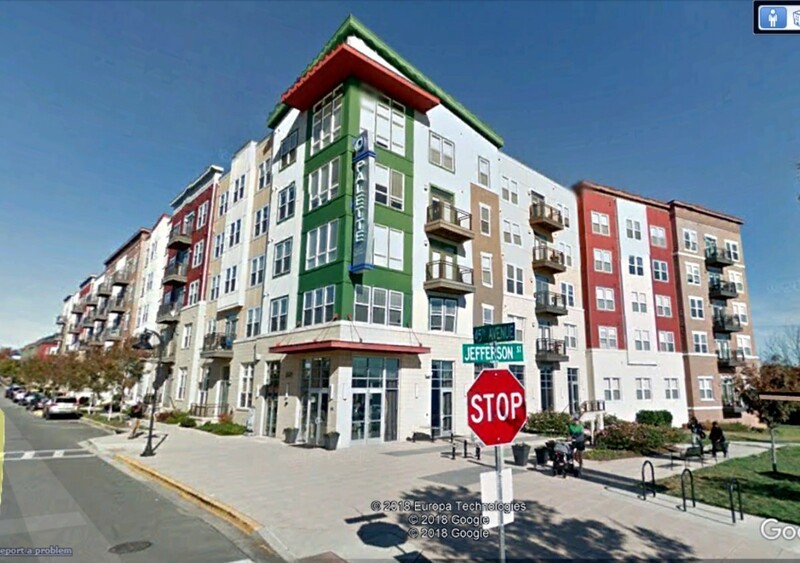 Check out this PowerPoint by architect Tim Smith to see other examples of attractive mid-rise mixed-use buildings at densities over 100 dwelling units per acre. A recent county-commissioned survey of developers found that the county’s comparatively low property values, high development impact fees, and cumbersome development review processes combine to make Prince George’s one of the most expensive places to build in the region. Likewise, even with the recent changes in the International Building Code discussed earlier, mixed-use development is still much more expensive to accomplish than traditional suburban sprawl. Prince George’s has been working for nearly four years to develop this new zoning ordinance. It will bring a lot of essential changes to the county, and there is no reason why the county cannot pass this legislation this fall. Before it does so, however, the county should amend these mixed-use zones to allow more housing units to be built in mixed-use developments. One solution would be for the county to eliminate the caps altogether in the new mixed-use zones. Charlotte’s mixed-use TOD zones take this approach by imposing minimum, but not maximum, residential density requirements. Another approach (one that I urged the County Council to adopt) would be to calculate both residential and non-residential density limits based on a more flexible floor area ratio (FAR) standard, which is what DC does. This allows developers to divvy up the available square footage into the number of homes and shops that makes the most market sense. There's a lot that's good about the pending zoning rewrite, but it's unfortunate that these housing density caps persist. With the caps proposed, it's reasonable to anticipate unsustainably large new apartments, and many profit-minded developers may simply choose not to build mixed-use buildings in Prince George’s County. The County Council is still taking comments on the proposed zoning ordinance. If you would like to weigh in with your thoughts on this or other issues, you may submit your written comments by email or via regular mail addressed to the Clerk of Council, CAB - 2nd Floor, 14741 Governor Oden Bowie Dr, Upper Marlboro, MD 20772.